That was Australian Prime Minister Julia Gillard, addressing the national press club about her stance on carbon prices last week. At least when it comes to the dynamics of climate change Gillard is right. Given the slow rate at which both the climate system and the energy infrastructure can respond to change, waiting to reduce emissions just makes the job harder, because later reductions have to be deeper and faster than early ones. 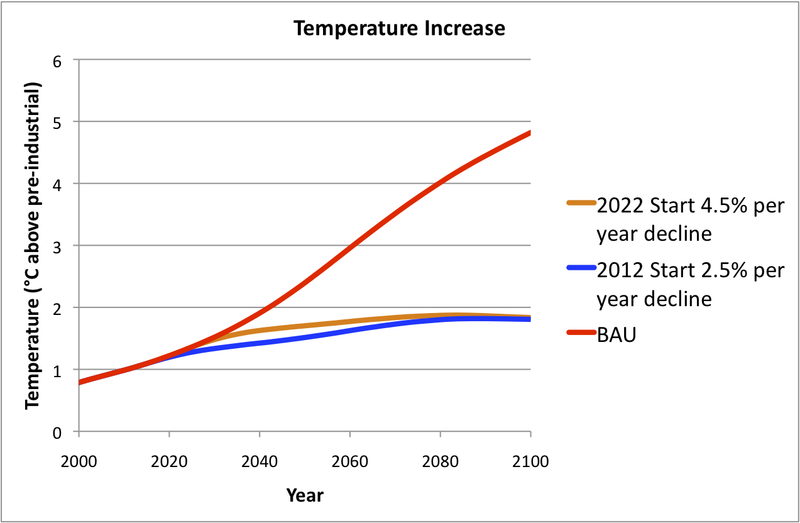 The graph above shows temperature change under three scenarios. The red, ‘business as usual’ line is driven by rising emissions and shows rising temperature throughout the century. 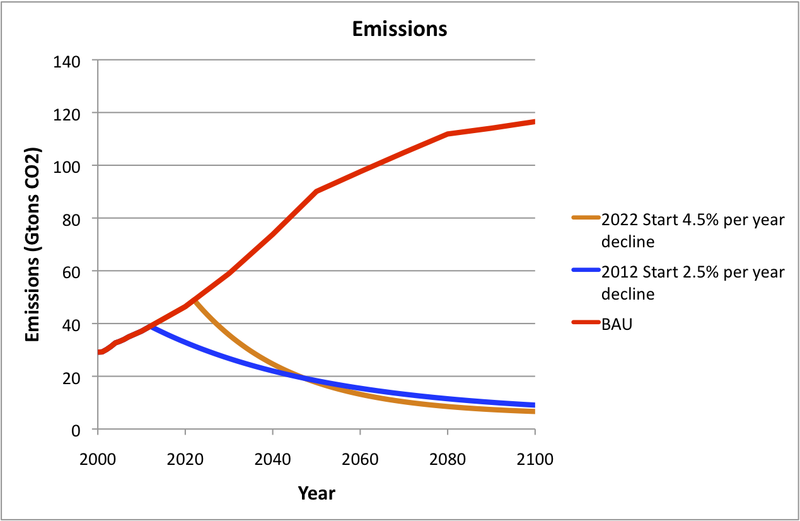 The orange and blue lines, are both emissions reduction scenarios, two versions of Gillard’s ‘something hard’. The blue scenario has the hard work of reducing emissions beginning essentially immediately, in 2012. The orange line has it beginning ten years later in 2022.
by steady reductions of 2.5% per year. But waiting a decade means that the reductions have to be much steeper to limit temperature to the same degree. In this case it takes 4.5% per year, a rate of reduction that energy models suggest would be very difficult and expensive (see Chapter 2 of last year’s Emissions Gap report from UNEP). In the delayed action scenario emissions begins to fall later, and must therefore fall more steeply in order to have a similar impact on temperature. New, more efficient buildings, cars, factories and power plants would have to come on line much faster in the late action scenario, and carbon intensive infrastructure might even have to be turned off before the end of its useful life. That means more expense and upheaval for the economy and for business and individuals within it. The hard work isn’t made easier by waiting. In our personal lives, and in the world of business too, we all know the temptation to put off a challenge, whether is it starting an exercise program or restructuring a firm. But we also know the risks of waiting and the danger that a problem not addressed will spiral out of control. That’s why we admire people who tackle hard problems straight on. When it comes to climate change, that is a quality of leadership our world needs more and more with each passing year.